After delivery on the 28th of July, the first 8-car Waratah Train or “A Set” commenced its testing on the CityRail network in August. A historic test occurred on the night of August 13th, when A1 made a trip between Camelia and Carlingford under its own power. This test seemed unusual to some, as the Waratah trains will not be used on the Carlingford Line in revenue service. The testing was done on the Carlingford Line due to the isolation of the line (thus making it easy to close for testing), and because of the steep gradient of the line providing a good test for some of the other steep grades in Sydney. This marked the end of the testing period with the PPTV (Pre Production Trial Vehicle), which will be returned to Cardiff at a future date. The motor cars from the PPTV will be used in one of the future Waratah trains, while the driver trailer units will be used as spares to replace damaged rolling stock in the event of an accident or derailment. The main criticism of the Waratah train to date is it’s late introduction, although this is due in part to the extensive testing and quality control being imposed on the train before it is accepted into service. The seamless introduction of the OSCar trains to the network was due to the rigorous testing program imposed on them before they were accepted into passenger service. The 78 8-car Waratah trains are being supplied by Reliance Rail, a consortium of Downer EDI Limited, AMP Capital Investors, Royal Bank of Scotland and International Public Partnerships Limited. The trains will be maintained by Downer EDI, on a 30-year contract to Reliance Rail. As reported in the July news, these trains will be leased by RailCorp and used for CityRail services. This is a dramatic shift in the previous method of rolling stock acquisition, where RailCorp would purchase the rolling stock outright from a manufacturer. The first 8-car set is due to enter service by December 2010, with at least four sets expected to be in service by March, 2011. EA2504 is the lead car on SP31, Sydney to Canberra passenger. The Xplorer railcars were introduced in 1993, as part of a project to re-introduce a daylight service to North Western NSW, as well as to allow the removal of the older, locomotive hauled passenger trains from the regional rail network. The Endeavour railcars were a follow on from the Xplorer design, albeit being modified to better suit commuters rather than booked seat passengers. The first Endeavour railcar would enter service in 1994. Although minor changes had been made to the fleet of both the Xplorer and Endeavour cars over their operating lives, no major overhaul had yet been performed. 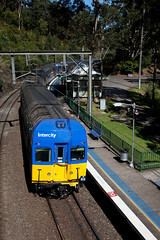 By May 2005, a number of changes had been made to the CityRail and CountryLink networks since the cars entered service. The most notable was the introduction of the new CountryLink colour scheme on the refurbished XPT locomotives and cars, as well as the introduction of the Hunter Railcars for use in the Newcastle and Hunter Valley region. By the end of 2006, a number of companies had been shortlisted to tender for the refurbishment of both the Xplorer and Endeavour railcars. The contract would eventually be given to Bombardier Transportation Australia in January 2008. The first railcars to undergo the refurbishment process would be TE2804 and LE2864, transferred to Bombardiers workshops at Dandenong (Melbourne, Victoria) on the 4th of March, 2008. Initially, the railcars were hauled down by an 81 class locomotive, although later transfers were often made under their own power. Once the cars to be refurbished had arrived at Dynon Freight Yard, the railcars were lifted from their bogies and placed onto broad gauge transfer bogies for the final leg of the journey. Due to the setup of the points at Dandenong, all transfers were run in push-pull configuration by Pacific National locomotives and crews, using surplus log and cement wagons to provide braking power for the railcars. The railcars then repeated the same process in reverse when they were to be returned to Sydney. 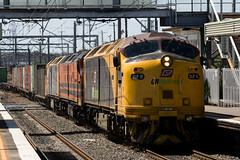 LE2858 is seen between log wagons at Springvale Victoria, on transfer back to Dynon where it will be put onto it's bogies and run back to Sydney with TE2808 and EA2508. The final transfer run would run from Dandenong to Dynon on Monday the 23rd of August, 2010, comprising cars TE2808, LE2858 and EA2508. These three cars marked the end of the refurbishment process, with all of the Xplorer and Endeavour cars now back in service at the time of writing. Something that often goes unreported in today’s media is when something is delivered on time – RailCorp pledged to have all of these railcars back in service by October 2010, under their 2010 Customer Charter, and they achieved this with over a month to spare. The 2010 CityRail Timetable is set to begin on the 10th of October, 2010, bringing with it a number of service improvements to Illawarra and South Coast Line commuters who felt they “missed out” in the 2009 Timetable. The completion of the Cronulla Duplication is the main trigger for the new timetable, allowing an increase in services between Cronulla and Bondi Junction during morning and afternoon peak hours, as well as during the off-peak times and on weekends. Another major change is that most weekend South Coast Line services will now terminate and commence from Bondi Junction, rather than Sydney Terminal. This will have the added bonus of “isolating” the Illawarra and South Coast Lines from the rest of the network, ensuring that any problems elsewhere in the network will not flow on to disrupt Illawarra and South Coast services. Finally, South Coast Line services previously performed by Endeavours will be replaced by electric trains where possible, with the Endeavours to be restricted to running between Bomaderry and Kiama (with the exception of positioning moves to/from Wollongong Yard, and empty car runs to/from Port Kembla to decant). Under the current timetable, a number of morning services between Kiama and Wollongong are provided by Endeavour sets running to/from Bomaderry. 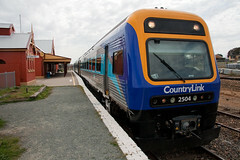 These services would normally connect with an electric train at Dapto, Unanderra or Wollongong, although now these services will terminate at Kiama, connecting with either a Sydney or Thirroul bound train at Kiama. V65 at Otford with a Sydney bound passenger train. With the new CityRail timetable, all weekend services on the South Coast will operate to/from Bondi Junction, pushing the V-Sets to Monday to Friday operation only... Is this the beginning of the end for these veteran trains? Finally, one other change is the increase in services on the South Line (Campbelltown via Granville) on a weekend from two trains per hour to four. The sale of QRNational (the largest public float since Telstra was sold) is set to proceed, with pre-registration open for interested parties to receive a pre-allocated offer of shares. Advertising has saturated both television and print media, with statements as “Australia’s largest coal hauler” being used to generate interest. However, this tactic might indeed scare off potential investors who are fearful of the company’s dependence on export coal for income. With global coal demand tipped to peak by 2020, it is questionable if QRNational can continue being a major player should the demand for coal from nations such as China be reduced. While QRNational has been making steady inroads in intermodal transport, it is still competing with companies such as SCT and Pacific National, especially on the lucrative east-west corridor. 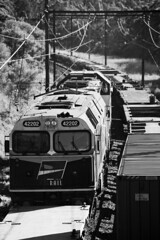 Further to the report in the July News, Southern Shorthaul Railroad have continued to make their presence felt in the business of coal transport, cementing their contract with Centennial Coal for transport of export coal from Newstan Colliery to Kooragang Island (Newcastle) and Inner Harbour (Port Kembla). To increase reliability and efficiency of the service, SSR has supplemented their two G Class locomotives (G513 and G514) on the train by obtaining G511 on long-term lease from CFCLA (which was recently painted into SSR colours at Bradkens Braemar Workshop prior to closing – see below). Following a period where G511 was used to allow G513 and G514 to return to EDI at Cardiff for maintenance, G511 replaced the two B Class (B61 and B65) on the train during August. For a short time the train ran as triple G Class, although in recent days C503 (also on lease from CFCLA) has been seen on the train. A number of new XRN Class locomotives have broken cover, undergoing trials in the Hunter Valley for X-Rail. X-Rail is a joint venture between Xstrata and Freightliner to provide additional export capacity for Xstrata mines. This is in addition to the current services already run for Xstrata by Pacific National. Three XRN Class are currently in service, XRN001 to XRN003. The X-Rail colour scheme is yellow, blue and grey. In addition, the first GL Class in Freightliner livery has been sighted in Adelaide, awaiting transfer back to NSW to work North Western export container services. GL111 is on long term lease from CFCLA, and has been repainted into the Freightliner corporate scheme accordingly. Bradken Rail closed their Braemar Workshop in mid July of this year, with at least 50 employees out of work. The Braemar plan has been notable for a number of repaints for CFCLA and SSR, as well as having done the refurbishment on the ex-DSB MZ III Class for Independent Rail. Bradken had just completed a major project providing coal hoppers for Pacific Nationals Hunter Valley and Queensland operations, with parts of the wagons imported from China and assembled locally. Management has placed the blame squarely on increased competition from overseas companies, notably rolling stock manufacturers in China. Authors Note: I’m aware that the October news is rather light on interesting photos, however it has been a busy couple of months. Please watch this space! I’ll be honest – July was not the best month for me when it came to photographing trains. Work and social commitments called, and the few outings that were made usually ended with a mostly empty memory card! Resolving that August would be different, and with the first of August being a Sunday, the opportunity was too good to pass up. With the line between Liverpool and Granville/Bankstown/Lidcombe closed to trains due to trackwork between the 30th of July and the 1st of August 2010, all freight trains into and out of Sydney on the Main South Line were forced to divert via Enfield and East Hills. Although closedowns of this nature happen multiple times a year, it is always a good chance to catch various trains on the East Hills Line that do not normally run on this section of track. Normally, the only regular traffic on this line is the passenger services to/from Campbelltown and Revesby via the Airport Line, as well as any through Southern Highlands services. Diverted traffic included the CountryLink trains to Canberra, Griffith and Melbourne, as well as the north/south intermodal and steel trains. As usual, a lot of non-time essential freight trains were cancelled or deferred until Monday, but that didn’t stop the running of QRNational intermodal services 7BM7 and 7MB7. Despite driving around the backstreets of Turrella, Bardwell Park and Bexley North, no suitable location was found for 7MB7, so the location chosen for 7BM7 would have to work for both trains. Hopefully the locomotives on each train would look different, so as to make the shots a little more interesting! Arriving at the spot just in time to hear the roar of an XPT engine, we found out that our delay in arriving at the location had cost us a shot of ST23, the southbound Melbourne XPT service. Undeterred, we set up for our planned shot of 7MB7, which arrived a little down on the table at 0900 (it was due to pass Turrella at 0827), passing our hillside location behind LDP009 and LDP005 – both in the QRNational corporate scheme. We did not have much longer to wait before 7BM7 arrived behind LDP001, LDP003 and an unexpected bonus in LDP006 (we were only expecting the first two!). Due to the quad tracks ending at Beverly Hills, it was quite likely that 7BM7 would have to wait for a southbound spark before it would get the road through to Macarthur and Glenlee. Thus, we packed up into the car for a short hop to Beverly Hills for another shot of the train. 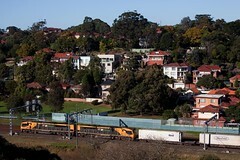 Despite the second shot being a very “last minute” decision, it carried with it an added bonus – not only were we shooting a freight on the East Hills line, but we could photograph it passing through the construction work associated with the project to quadruple the East Hills Line between Kingsgrove and Revesby. With no more freight trains forecast to use the line for at least an hour or so, we relocated to western Sydney for a shot at some of the trackwork trains on the “old south”. Trackwork trains are an interesting and unique beast – often boasting some of the most vintage motive power and interesting rolling stock on the network, unless they are sitting in just the right spot, they can be impossible to photograph – as they often don’t move for hours at a time! Initially, we had mixed luck – we located GM22 and GM10 fairly easily, sitting on the down main between Fairfield and Canley Vale Stations with a ballast cleaner rake (with the tracklaying machine between them and Fairfield Station, as it was being used to lay a new down main between where the GM’s were and the platform at Fairfield). Additionally, 8170 was standing next to the two GM’s with an empty railset. Sadly, the shot was looking straight into the sun! 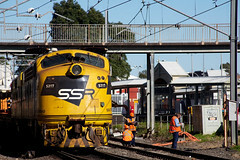 S317 and GM27 sit at Fairfield with a sleeper train, while trackworkers inspect the up main. Undeterred, and acting on a tip from the crew of GM22, we moved north to Fairfield Station, where we were told we could expect S317 and GM27 with a sleeper train. Sure enough, they were sitting right at the end of the platform, under the footbridge. While the angle wasn’t perfect from the bridge, a nice angle was obtained from a nearby carpark, looking over the fence with the use of a milk crate “borrowed” from a shop in Bardwell Park earlier that morning. With word that an IRA ballast train was further north, we moved up to Yennora, to find a ballast train with 4497 on the country end, and ARG-owned 2208 on the city end. 2208 has only recently been hired by Independent Rail for use on container and trackwork trains. We were lucky that the two locos were on a double consist of ballast wagons, which placed 4497 right at a level crossing, and 2208 at the end of the platform at Yennora. After grabbing a couple of shots of 2208 and it’s ballast wagons, it was off to Guildford where 8134 and 8120 were push-pull on another ballast rake. Without an exciting photo opportunity, we pressed on and called it a day – and it was only 1115! Why push ones luck, when there is a good opportunity to head home and download the photos and even squeeze in a nap before dinner?!? For more photos from the day, visit August, 2010 on Flickr! With thanks to Chris Walters and Todd Milton for their assistance and company when compiling this article. The plan was a sound one. Set up at Rookwood (Weeroona Rd, Strathfield), and get a nice, evenly lit photo of 42202, which remains in the Northern Rivers Railroad scheme, despite being in QRNational service. All going to plan, 42202 would lead 2152 QRNational Glenlee to Yennora freight, as it had done the day prior. Following this shot, a relocation to Mascot would be made to allow for a shot of RailCorp Mechanised Track Inspection Vehicle ML-039 over the Alexandria Canal, near Cooks River Yard. As this unit will one day be retired, it is always worth getting a shot of it; especially in places it is not often seen. 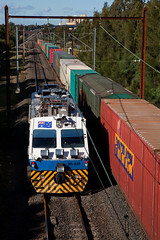 ML-039 is seen at Rookwood crossing 4MB4 PN Intermodal service. We arrived at Rookwood at 0845, and with plenty of time before 2152, we spent our time recording the other freight movements along the stretch of track that links Chullora Junction with Flemington Goods Junctions – the former being the busiest junction on the Metropolitan Goods Lines, with most freight trains, be they interstate superfreighters or short container trip trains, passing through Chullora Junction at some point on their journey. The first train to pass Rookwood would be just after 9am. Solo 44208 headed up T285 P&O Botany to Yennora container trip – 44208 having been recently repainted by Bradken Rail at Braemar, a “touch up” of the CFCLA colour scheme. While it would not appear that a full repaint was done, the CFCLA livery has been reapplied over the previously grey patch along one side of the loco, where 44208 had previously sustained accident damage. Roughly half an hour later, the familiar blue and white livery of LDP001 and LDP003 could be seen navigating the northern fork of Chullora Junction, hauling 4MB7 QRNational freight to Brisbane. Twenty minutes later, triple 81 class rolled through with 8938 Manildra Group flour service to Bomaderry, having come into Sydney from Manildra overnight. They would cross 4MB4 at Chullora Junction, the latter train headed up by NR13 and NR60. NR60 was only recently repainted into the Pacific National “Stars” livery, from the previous National Rail “SteelLink” blue/grey scheme. Curiously, at this point, we had not seen T280, which is one of the regular trains to operate between Yennora and Botany (the opposite working to T285, above). Normally T280 and T285 cross anywhere between Auburn and Campsie. T280 especially is on a very tight path, as it leaves Yennora just after the “freight curfew” ends, to run to Botany before returning to Yennora before the afternoon “freight curfew” comes into effect. 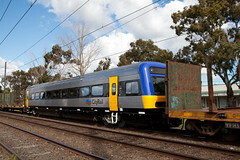 If the train is late into Botany, it is often late out, which throws loading and crew rosters way out, as the train will often be left sitting at Enfield to wait for the afternoon peak hour to subside. Following close behind 8938 was ML-039, the RailCorp mechanised track inspection vehicle. ML-039 ran down to Chullora Junction, before moving out along the north fork of the junction, and then returning back to the goods lines. This movement would cause 4BM7 to come to a stop at the signal near the Weeroona Rd overbridge to await the line ahead to clear. Once ML-039 had departed for Botany, X53 and 42202 then appeared around the northern fork of Chullora Junction with 2152 Glenlee to Yennora container freight. Sadly, by the time the locos were in view, 4BM7 had moved up to the signal protecting the junction, and the shadows from the containers on the train were blocking the “ideal shot”. Not to mention the fact that 42202 was hiding behind a bright yellow X Class! As we are not ones to be discouraged, we set about getting a shot of X53 and the 422 with their (short) train. Sure enough, as soon as they cleared the junction, 4BM7 was given the road to proceed onto the goods line to Sefton and on to Glenlee where they would shunt loading for Sydney, and wait for loading for Melbourne to arrive from Yennora (42202 and X53 would return to Glenlee with 1253, the Sydney to Melbourne loading for 4BM7, and then return to Yennora as 2154). With the shot of 42202 a write off for today (a shot of the yellow X was an acceptable compromise), it was time to relocate to Mascot, to a spot overlooking the Alexandria Canal, near Cooks River Yard. The plan was to get a nice shot of ML-039 returning from Botany, possibly reflected in the (un)clean waters of the canal. When we arrived, any hopes of a reflection shot were firmly dashed, as the breeze was up – ensuring that the water was as unhelpful as possible. Never mind! Shortly after we arrived, GL107 wandered past light engine, towards Botany on the main, followed by 4497 and 4703 push-pull with T250 Minto MIST to Botany container trip train (also on the main). Soon thereafter, a rake of containers was propelled back over the canal by 1443, this train running on the refuge. GL107 was waiting at the Botany end of the refuge, to shunt loading bound for MIST at Minto. While GL107 and 1443 were shunting their wagons (the loading not bound for Minto would later run to Botany behind GL107, while 1443 would head back to Cooks River), ML-039 snuck past on the main, with the shot more or less blocked by the containers on the near track! Again, forced to make do, we did get a shot. Of course, it was not the one we planned on! Determined to catch the rest of the traffic out of Botany, we moved to Gelco, located at the throat of the main Botany Yard complex. It was here that we recorded 4703 and 4497 running light to Mascot siding to pick up their train (T251 to Minto). Behind the light engines was T281 P&O Botany to Yennora container trip, behind 44209 and 4477. As the train was stopped at a signal, one of the crew members came over for a word, mentioning that the train had never made it out of Botany that morning (normally, the train that forms T280 in the morning runs out from Botany before the morning peak hour starts). As the train was late departing, they never made it to Yennora, hence why we did not see them at Rookwood that morning! After the characteristically ALCo departure of 44209 and 4477, DL44 and 4892 headed up Patricks PortLink T171 from Botany to Sandown. They were followed in turn by 8049 and RL306 with 1443 South Spur Rail Services Botany to Walsh Point container freight. 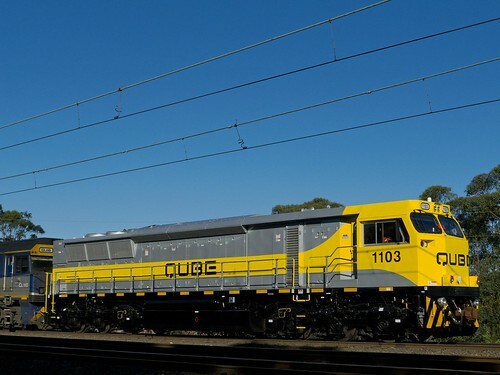 With P&O set to purchase SSRS from Coote Industrial in the immediate future, it remains to be seen if the existing Greentrains (a division of Coote Industrial) locomotives will continue to lead these trains, or if alternate (CFCLA) motive power will take over. So, even with all of the setbacks, it was still a great day trackside, and some interesting movements were seen. With the aforementioned sale of SSRS, and the pending closure of Seatons at Sandown (and the resulting cessation of Patricks PortLink services from Botany), these sightings may be little more than a memory before the end of the year. Finally, thanks to Chris Walters for his company on the day, and his assistance in compiling the train numbers for this article. 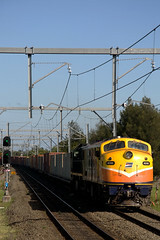 Typical of the changing face of QRNational Intermodal trains - CLP11/CLF1/CLP13 lead 7BM7 south through Adamstown. The operators section has a new member, with the QRNational/Interail page being added today, along with a host of new photos of QRNational trains in late 2008/early 2009 being uploaded to Flickr. Of course, the contents of the page won’t stay valid for long, with the first of the 6000 class nearing completion in the United Goninans facility at Broadmeadow. Such are the times we exist in though. Starting from Sunday February 22nd, control of the container shuttle from Yennora to Port Botany will again change hands from Interail to P&O Trans Australia. This is the third operator in twelve months to run the service, which typically departs Yennora Distribution Park just after the morning freight curfew ends, and runs to Port Botany via Enfield. 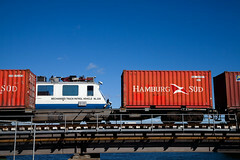 In the first few months of 2008, the service was run by Patricks Portlink, until the completion of their contract, at which point it passed under the banner of Interail – QRNationals interstate intermodal carrier brand. It now passes from Interail to P&O Trans Australia – a new operator in NSW. QRNational and P&O (owned by Dubai Ports World) have a close history of contracts for rail transport in Australia. CFCLA recently sold their 44 Class fleet (4468,4471,4477 and 4483 – although only 4471 and 4477 were in service at the time of the sale) to P&O Trans Australia, which saw 4471 and 4477 sent to Junee Roundhouse Workshops (JRW) for repainting. At the time of writing, the units have now returned to Sydney, the only change being that 71 and 77 have had their CFCLA logos painted out – they still remain in the CFCLA scheme for now. With the change of operator, the train numbers change again, with T280 expected to be the first train to be run by P&O Trans Australia to depart Yennora on Monday the 23rd of February. Standard motive class is expected to be a pair of 44 Class (ie 4471 and 77) but it is unclear at this stage where the locomotives will be maintained, and what motive power will be used when one or both units are out of service for maintenence.